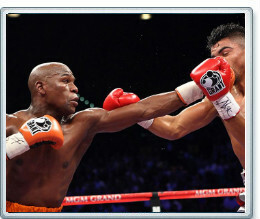 After much delay and conjecture, Golden Boy and Mayweather Promotions announced on Friday morning that the card featuring Floyd Mayweather and Victor Ortiz tallied 1.25 million purchases for a gross of $78.4 million. This is the second most lucrative non-heavyweight pay-per-view event behind Mayweather - Oscar De La Hoya (which totaled $136.8 million back in 2007). I tried to get a comment from someone at HBO and was told by a spokesperson that the numbers put out were verified - but at the same time, they couldn't go on the record. Hey, they announced it and I have absolutely no reason to doubt them. None at all.